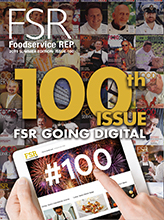 Foodservice Gateway » To keep customers coming back…serve up the spuds! To keep customers coming back…serve up the spuds! Potatoes are not only popular as a vegetable serve and in summer salads, they also make an ideal snack or plated meal, and not just in the form of hot chips. More and more Aussies are recognising the great taste and nutritional value of the humble spud as the takeaway and eat-in baked potato phenomenon which has proven so popular in Europe and Britain starts to hit our shores. Did you know one medium-sized (150g) potato provides a good proportion of the recommended daily requirements of many important vitamins and minerals? It’s a natural source of folate, niacin, Vitamin B6, iodine, thiamin, Vitamin C and also contains dietary fibre and protein. Now, thanks to King Edward Potato Ovens, you can serve up delicious freshly baked potatoes to your customers with ease. King Edward designed and produced the world’s first counter-top potato baker and is still the market leader, offering a range of ovens in traditional and contemporary designs to suit any foodservice business. Whatever your requirements, there’s probably more than one King Edward oven to suit you. The flagship products in the King Edward range are made of high quality stainless steel, with rounded corners for easy cleaning, and removable chrome plated shelves which allow you to cook any product you like, just as in any commercially made convection oven. Heat up from cold is fast – these ovens are highly efficient and thermostatically controlled at various temperatures up to 250deg C.
Best of all they are a cost-effective investment for your business, making it easy to serve up quality baked potatoes to your customers. Once you’ve got your potato oven, it’s easy and economical to develop a range of baked potato menu offerings which customers are sure to love. All you need to do is top your potatoes with appealing, flavoursome ingredients that will complement that freshly baked spud taste. Stagg Chilli from Hormel Foods is the perfect example. This quality chilli and meat sauce is made with 25 per cent beef and boasts a distinctive yet mild flavour. 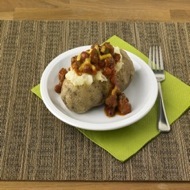 As such as it’s an ideal ingredient which you can quickly and easily add to the baked potato to impart terrific taste. Stagg Chilli will hold well in the bain marie which you can obtain from King Edward along with your potato oven. You can either use Stagg Chilli as is, or add your own extra ingredients to create a distinctive ‘signature’ flavour for the finished meal item. Its mild flavour profile makes it easy to add more chilli or other components so that you can customise orders to suit individual consumer tastes. The simple addition of fresh chilli or chilli flakes, along with other vegetables, means you’ll always be able to control the heat as well as the overall flavour profile. Stagg Chilli comes in an economical 3kg can from Hormel Foods, which also offers Wholly Guacamole – another ideal ingredient to go with baked potatoes. Made from hand-scooped Hass avocadoes that have been packaged at high pressure to avoid the use of chemicals or heat, this pre-prepared frozen guacamole enables you to avoid the time and labour of preparing guacamole from scratch, as well as the fluctuating price of fresh avocadoes which varies depending on the time of year. Instead, you can have consistent quality Guacamole on hand whenever you need it (frozen shelf life is 18 months). Serve Wholly Guacamole up on a potato cooked in a King Edward Oven along with Stagg Chilli and sour cream for a tasty Mexican style takeaway snack or full meal. So why not add these cost-effective choices to the menu today? A King Edward Potato Oven, fresh spuds, Stagg Chilli and Wholly Guacamole – that’s a winning combo that’s economical for you to prepare, with minimal staff, labour time and energy costs. You can charge a good pricepoint per serve, and best of all your customers will love it!